Various adjectives come to mind when attempting to describe style maven Paola Mathé, the multi-talented tour de force behind Fanm Djanm and her personal blog Lost in the City. Bright, arresting, intelligent, supportive, confident and inviting are just a few. The stunning Haitian beauty and founder of Fanm Djanm joined HCX at Kinanm Lounge & Bar in Brooklyn on Thursday, March 19th for our An n’ Pale series with HCX Director Régine M. Roumain. The evening opened with a special poetic performance by Schneider Laurent and Marc Henry Valmond. Theirs was a thought provoking, passionate, and seductive piece performed to an imagined beloved and paying tribute to such greats as Frankétienne. As to where the idea for the head wraps came from? 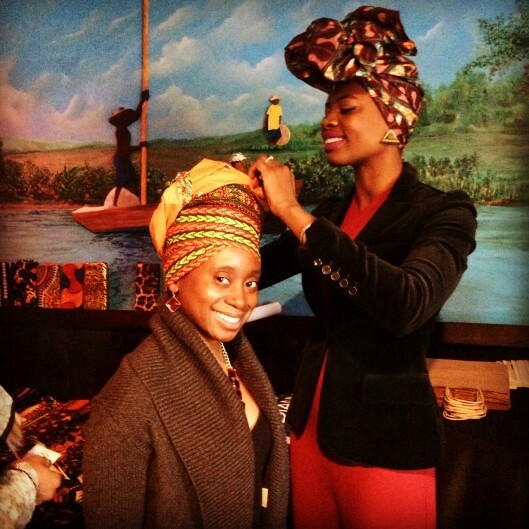 “I had always worn head wraps and then at some point, I just became known as the tall lady wearing the head wraps! She joked. The evening appropriately ended on a fun note with an impromptu head wrapping session. We thank Paola for a wonderful night of dialogue. Click here to look at photos of this An n’ Pale. Click here to purchase a beautiful headwrap. This entry was posted on Wednesday, March 25th, 2015 at 4:51 pm	and is filed under An n' Pale, Archive, Events, Fashion, HCX Programs. You can follow any responses to this entry through the RSS 2.0 feed. You can leave a response, or trackback from your own site.